Has Rome prevailed? Is the Britannia TV show cancelled or renewed for a second season on Amazon? The television vulture is watching all the latest TV cancellation and renewal news, so this page is the place to track the status of Britannia, season two. Bookmark it, or subscribe for the latest updates. Remember, the television vulture is watching your shows. Are you? An Amazon Prime Video historical drama, Britannia stars Kelly Reilly, David Morrissey, Nikolaj Lie Kaas, Liana Cornell, Gershwyn Eustache Jnr, Mackenzie Crook, Barry Ward, Stanley Weber, Joe Armstrong, Fortunato Cerlino, Callie Cooke, Aaron Pierre, Eleanor Worthington-Cox, Zoë Wanamaker, Ian McDiarmid, Julian Rhind-Tutt, Hugo Speer, Daniel Caltagirone, Zaqi Ismail, and Annabel Scholey. A century prior, even Julius Caesar failed to conquer Britannia. Now, in 43AD, Emperor Claudius has dispatched General Aulus (Morrissey) with 400 ships bringing 20,000 men to its shores. There, the Romans must deal with warring Cantii and Regni tribes, warrior queens, and the enigmatic Druids. As of April 26, 2019, Britannia has not been cancelled or renewed for a second season on Amazon, but Sky Atlantic has renewed it. Stay tuned for further updates. Unless they decide to publicize its viewership, it is hard to predict whether Amazon will cancel or renew Britannia for season two. Since it is a Sky Atlantic TV series, its success in UK is crucial to whether or not there will be a second season for Amazon to pick up. For now, I’ll keep an eye on the situation and update this page with breaking developments. Subscribe for free alerts on Britannia cancellation and renewal news. 3/16/2018 update: Sky Atlantic has renewed Britannia for a second season. Amazon hasn’t announced a cancellation or renewal, but this points to a second season in the US. I’ll update when we hear more from Amazon. Details here. Find more Britannia TV series news or other Amazon TV show news. What do you think? Do you hope the Britannia TV show will be renewed for a second season? How would you feel if Amazon cancelled this TV series, instead? Please renew. You have left us with a cliff hanger. It must go on! Oh please please continue Brittania if for no other reason than Hurdy Gurdy. 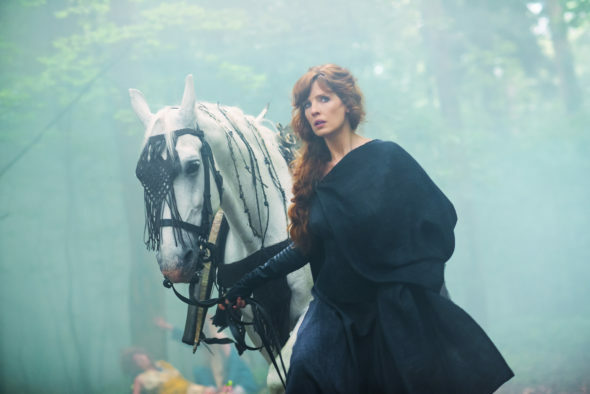 Seriously, even without my Girl Crush Kelly Reilly, I love this show, the approach, the story line, the historical connections, the characters, the deeper look into the Druids, and it is a breath of fresh air for historical fiction and drama. We at least need to see “what’s next” for the girl with no name! This show sparked my attention! It is not a cut and paste redo like most series. Please make season 2 available Amazon.